There's a new posse of gluten-free bloggers who are tackling the art and science of GF baking with two central premises: 1) that measuring ingredients by weight rather than volume will produce better results and 2) that each species of baked good is organized around a ratio of liquid, flour, eggs and fat. This band of baking bloggers was organized by Shauna, the Gluten-Free Girl (and the Chef), several months ago, and has so far tackled Pancakes, Quick Breads/Muffins and Scones. How exciting and freeing it is to join this creative gang! I feel like this approach will give me much greater confidence as a baker and I'm looking forward to cozying up more with my oven and kitchen scale. Unlike most of the other GF Rallyers who use lovely new digital kitchen scales, I realize I am probably the only one kicking it old school - like early 20th century old school- with my kitchen scale, but it's very accurate and it fits my cluttered country kitchen. I can't tare it out (start at zero) but it's easy arithmetic to weigh my bowl before filling it with my flour combos and then just subtract it from my final weight. This month's Gluten Free Ratio Rally challenge was to experiment with Pate a Choux. Our hostess this month is chemist and culinary expert Erin Swing of The Sensitive Epicure, who has the fantasy job of investigating Gluten Free recipe formulation at Ferran Adria's research and development facility in Spain. Okay, that's some street cred! Erin's choice of Pate a Choux was intriguing. Now there's a versatile dough in the baker's arsenal. Sweeten the dough a bit and then plop down little round blobs (choux means cabbage in French - mon petit choux is a charming endearment for your loved ones- and the baked results do resemble young garden cabbages) and you get lovely puffs that you can fill will cream (whipped or custard cream) and call cream puffs. Ovals of pate a choux, filled with cream and iced with chocolate become eclairs and classic French bakers have lots of other toothsome creations to Fill them with ice cream to make profiteroles or cement a whole pile of cream puffs together for an impressive croquembouche. Fry them and fill them with sweetened ricotta cheese and you have zeppole. Really, that pate a choux is something. If you fancy something more savory, you can take out the sugar from your pate a choux, add some shredded cheese and savory mix-ins, and you have gougeres to accompany a stout glass of red wine. Or a red glass of stout, whichever you prefer. Or one could stuff cream puffs with egg salad, chicken salad, herbed cream cheese or other savory filling for a showstopping appetizer. There was no indecision about what to do with my Pate a Choux: I HAD to make Cream Puffs for my family. Cream Puffs are something that we expect to come from a bakery. They are FANCY and FRENCHY and they are one of the items that my dessert-obsessed, Czech-born father-in-law tempts us non-GF types with when we come for dinner. My gluten-free husband settles for a dish of ice cream or a slice of my mom's GF cheesecake. The GF Ratio Rally started off with a ratio of 2:1:1:2. (2 parts flour, 1 part egg, 1 part fat, 2 parts liquid). I used a combination of flours and kitchen tips gleaned from my cookbook reference shelf and Internet recipes. It seems that the key with making a successful pate a choux is to make sure that the ball of flour, butter and water that is boiled up on the stove cools enough to allow one to vigorously beat in one's eggs without cooking them. The other technique that is critical is to make sure not to underbake one's pate a choux or it will not puff up and form that pocket to stuff with something luscious later on. In medium saucepan, heat butter, water, sugar and salt until butter melts. Bring to a rolling boil. Add flour, stirring constantly with a wooden spoon, until a ball of dough forms and moves away from the sides of the pan. Remove from heat and cool for 5-10 minutes, until dough is just warm. Add a bit of the beaten egg and mix vigorously to incorporate. Keep adding bit of the beaten yolk and beating, until it is all incorporated and dough is cohesive. Line a cookie sheet with parchment paper. Plop 12 rounded balls of dough onto cookie sheet about 2 inches apart. Round down any points or bumps with a wet finger. Bake in preheated 425 degree F oven for ten minutes. Reduce heat to 350 degrees and bake another 20 minutes, or until puffy and golden brown. Remove cookie sheet to baking rack to cool 5 minutes. Remove cream puffs and transfer to rack. Poke each cream puff with a sharp knife to start a hole for filling later on. Let cool completely. Chill beaters and metal mixing bowl in freezer beforehand. Mix all ingredients and then mix with beaters until cream is fluffy and forms soft peaks. I then split my cream puffs, stuffed then with a generous dollop of this coffee-flavored cream and dusted the tops with some confectioner's sugar. It was so satisfying to see Dan come home to dinner, not expecting his mostly non-baking wife pull out a plate of cream puffs, dusted with confectioner's sugar and stuffed with coffee-flavored whipped cream. He was incredulous that they were okay for him to eat and promptly polished off three. Actually, he inhaled the first and second cream puffs and sneezed from inhaling the powdered sugar. After dinner he scarfed down a couple more, though a little more slowly and with sighs and lip smacks. Now, my batch of cream puffs were actually not spectacular. From what I can determine, they were underbaked, so they did not did not have much in the way of puff. But they were filled with cream and did taste great and after at least six years of not having a cream puff orbit his lips, Dan was pretty happy. And so, despite having made a batch of Cream-Filled Flatties, I think of this experiment as a success and look forward to playing around with it more. 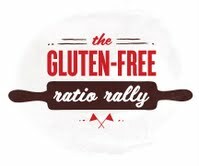 I'm excited to see what the rest of the Gluten Free Ratio Rally bloggers come up with for this round, which will be revealed at The Sensitive Epicure today. There will be lots of great links for other gluten-free pate a choux creations of all kinds, so do stop by. Great job with these! We're trying to figure out how to make a good gluten free pie crust with coconut flour, and it feels like a whole new world. You gave some good tips for people venturing into gf baking. Coffee cream filling! How delicious! The filling looks delicious! Good luck on your next batch! Wow loving that coffee cream!! It's ok mine didn't puff that much either, but my husband didn't seemed to enjoy them quite well too. Great job this month!! very cool scale! i love the coffee filling idea... anything coffee and i'm there. :) well done. I've got a scale like yours, blue, that I inherited from my grandfather. I never use it (it doesn't measure in grams), but I'll never get rid of it, either! Your cream puffs look delicious! I love the sound of coffee whipped cream. If the pastry was tender and Dan liked them, I still think it is a win! Coffee cream is my favourite profiterole filling too. The coffee cream looks wonderful - coffee is one of my favoritest flavors, and even if they weren't as puffy as you had hoped, yours look fantastic! Thanks for all the kind comments, everyone. I tried another batch using a third egg and a little longer baking time, and they were still cream flatties, not cream puffs, but they were still delicious! I'll keep trying though and maybe I'll figure out the perfect variation on this recipe. I love the coffee cream, too! Simple is hard to do! And overlooked and underrated. Nice work. Thank you for participating in this month's GFreeRally challenge. It was a doozy!